Adjustable 1" wide leash�with padded handle for comfort and "quick clip" opening handle for easy tie ups. The Sports Doggie Leash is 1" wide and is a feature packed lead designed to answer many of the every day problems of walking your dog. This leash is fully adjustable from 1 to 6 feet. The handle on this leash is padded for comfort and contains a "quick clip" feature for easy tie ups. Unbuckle the handle to quickly and easily wrap it around a post or table leg when you make a stop. Add our Handle Extender to make the handle larger, enabling you to wrap it around something bigger like your waist or a tree. 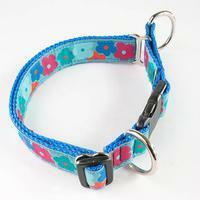 Adjustable 1" wide collar with limited slip feature.